This article is brought to you by 99designs. They have a new service for book cover design. Authors and publishers can now hold contests to find a book cover their readers will love! This article was updated on January 20. If you have a WordPress blog, chances are you’ve written or will write enough content to fill a book. Even if you don’t have enough material for 200-300 pages, remember, today many eBooks are only 10-100 pages depending on the purpose and target audience. If you want to build up readership one of the best ways to increase your audience is through repurposing your content. By taking your best blog posts and combining them into a mini-booklet, you can then use it as a giveaway to improve your email marketing strategy, even sell the guides for a profit, or just use the materials as a way to boost your credibility. Although packaging your blog posts into eBooks can sound like a daunting task, WordPress’ versatility makes it possible for you to convert your content with ease by using off-the-shelf plugins. Anthologize is an open-source plugin which allows you to use a drag and drop editor to create your eBook with a few clicks. The feature which makes Anthologize stand out from other tools is that it hooks into your existing site rather than requiring you to pull content into a blank WordPress install. Upon installing the plugin, users are provided a new panel within their install. Simply create a project for each book you plan to create. From there, adding content to your book is just like creating a menu in WordPress. The only difference is that instead of menu buttons being created when you call blog posts, an eBook is generated from your outline. Anthologize even supports pulling content from external RSS feeds, so if you have content across the web (or are packaging content for clients) you can handle it from a central location with ease. Although this is a great tool for many, the biggest limitation is that you need to have a self-hosted WordPress install for it to work. 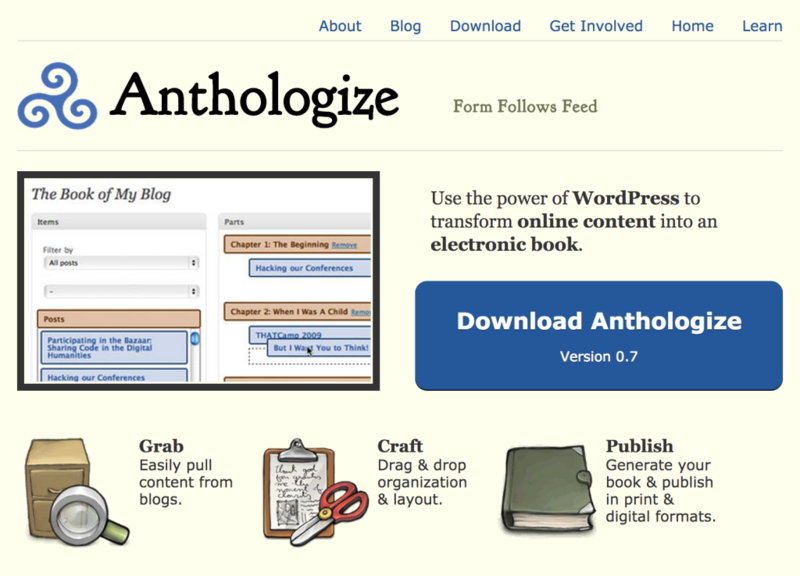 Anthologize does not work with sites hosted on WordPress.com since that platform doesn’t allow users to add custom plugins to their sites. For users who prefer using WordPress.com for their publishing needs, Bloxp is a helpful tool which allows you to create an eBook without worrying about technical hassle. Simply enter the RSS feed with the content you want and then use the Bloxp site to select the specific sections to export. From there you can download your eBook. The two biggest limitations of Bloxp are that you can only export to EPUB format and the final product has a cover page containing a watermark. While you can always create a custom cover page, and convert the EPUB file to other formats if needed (Calibre is an excellent tool for customizations), these are both extra steps you need to take rather than them happening out of the box. 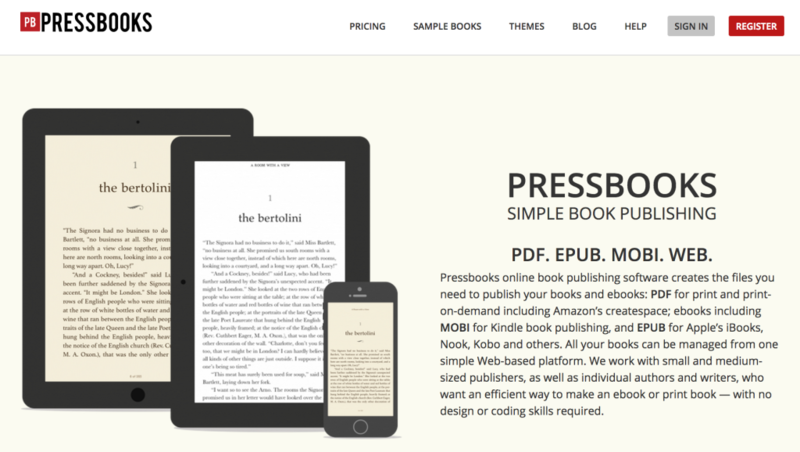 If you plan to publish digital booklets often, then PressBooks likely is the tool for you. PressBooks is a little different to other WordPress publishing solutions because this plugin is intended only for fresh WordPress multisite installs. In general, WordPress multisite isn’t too difficult to setup and configure, however if you’re not comfortable with manually changing your wp-config files, then this plugin probably isn’t a good fit for you. The most notable asset of PressBooks is the wide selection of themes included with the plugin which provides you with multiple formatting options which have been confirmed to work on a variety of devices. Additionally, PressBooks supports importing content from Microsoft Word, plus if you want to have multiple contributors on a project, that also can be setup within the plugin. PressBooks comes in both free and paid editions. The free version is available as a plugin to install on your self-hosted website but it places watermarks on the files you create. To remove the watermarks, there is a one-time fee of $25/book for EPUB and MOBI files, and $100/book to also clean PDF file exports. Although this guide outlined a few ways you can package content for the web, if you want to really put your materials to use, you should read up on how to earn a passive income through your products. Aside from helping you to earn extra money, having digital products for your customers can be a great asset for boosting your credibility. Also, remember that while these tools greatly help to streamline the self-publishing process, they aren’t perfect solutions. Depending on the type of content within your posts, you may have to manually edit the page layouts yourself or contract an experienced designer familiar with eBook creation.